I used to save my favorite things for special occasions. I thought that made them more special, or maybe I thought I didn’t deserve them all the time. Mostly though, I couldn’t enjoy my favorite things and all of the everyday stuff. It was too much. After decades of accumulating stuff and things, I forgot what my favorite things were. Ruthless decluttering was a great reminder. After selling and donating the majority of our stuff, we were left with our favorite things. 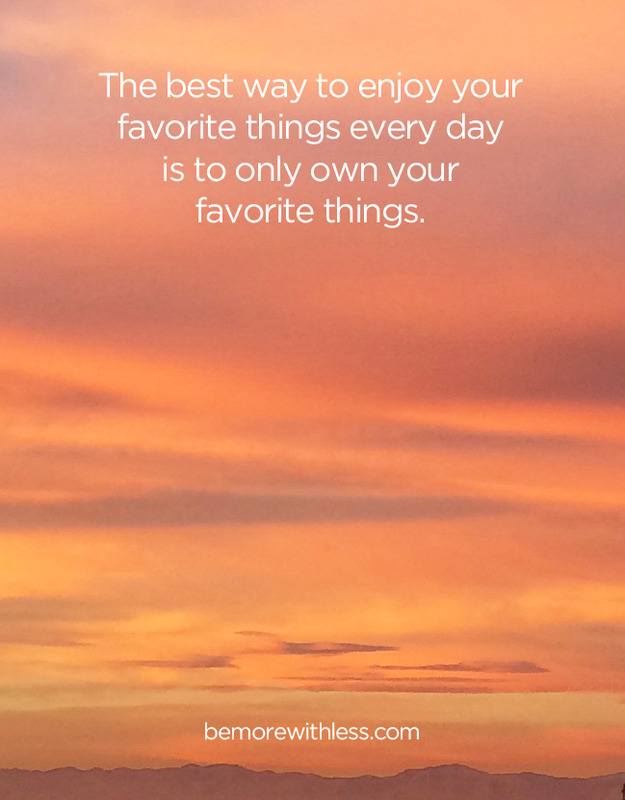 The best way to enjoy your favorite things every day is to only own your favorite things. Having it all doesn’t require owning it all. Take a look at the things in your life, the things you use every day. Are they your favorite? Donate your duplicates, the jeans that haven’t fit in a long, long time, and those trendy items you thought would make you happy, but now reside in the back of the closet. Dress with less and wear your favorite things every day. Sell the equipment, gear, or supplies from the hobby you gave up years ago and make room for your favorite hobby or interest. If sleeping on the ground isn’t your thing anymore, let the tent go and discover more enjoyable ways to explore the outdoors. How do you really want to spend your time? Make time and space for that. Use your grandmother’s china, the wine glasses from your wedding, and other things you love in your kitchen every day. Display sentimental photos or other items instead of trendy decor. If your kids play with the same things day after day, those are their favorite things. Donate the rest with their help. The best things aren’t things, but less is not nothing. We do need some things in day to day life. Getting rid of the clutter, and things you don’t use or love provides space to discover what you really want and need, and the time you deserve to truly enjoy and appreciate it. It’s reassuring to know that I’m not the only one who hesitates to wear or use her best things! I think it’s an old habit from childhood and Sunday “best.” I’m already simplifying, but now I’ll also take your encouragement to use my favorite things. Thank you so much for your devotion to inspiring others with uplifting prose, enlightening stories, helping people learn joys in life living with gratitude, seeing beauty in being thankful with less. I also grew up with the idea of saving things for special occasions, which sometimes never materialized! I’m trying to give myself permission to use favorite things, and love the idea of only owning favorite things. What I’m curious about is if we end up taking our favorite things for granted. I’m always in the camp that you should use the fancy China all the time (and that’s specifically why we didn’t ask for China for our wedding, because one sry of dishes is enough). But with clothes and whatnot, I wonder if, over time, you get diminishing returns. I guess it helps you determine what’s actually favorite and what you think is favorite. You might think these shoes are your favorite so you wear them more often to enjoy them, but maybe you just wanted them to be and turns out you don’t really like them. Just musings. Yes, favorite things often change as time goes by, but that’s okay. Styles change too, and materials and technology. In today’s world, there are lots of things that we don’t keep for very long. So, if a favorite item doesn’t stay that way, or if it turns out that it wasn’t really a favorite, no big deal. That just means it can be donated along with other clutter, freeing up space for new favorites! This post is soothing to read…you can gently get rid of what doesn’t work anymore. I’m lucky that the good will is just blocks from my house and on my way to work. I can just pull into the parking lot, unload and pull back on the road to work…takes less than 5 minutes. I have taken trunk loads and sometimes a small bag with a shirt or shoes that I haven’t worn in a while. Always feels good to get rid of stuff I’m not using. Roo from SemiProper had a post similar to this topic(http://semiproper.com/use-it-up/) where she talked about why she gleefully used up her favorite candle instead of saving it for a special occasion. Asking myself “do love/really like this?” before I buy anything or when deciding if I want to keep something in my home has been a HUGE help. I was able to finish a major purge last weekend that resulted in me giving away some things I never thought I’d part with, and the result is awesome. My hair/beauty products have been drastically reduced. There’s still art on the walls and a few pillows on the couch, but my house is calmer, easier to clean, and I enjoy and use everything that’s there. I LOVE the name of your blog. I’m sitting back, nodding and just taking notes. I have found when you read, speak less and do more, things get done–at least on my end. Thanks for sharing! I really love this. My grandmother has 7 full sets of china, left to her from various relatives as the only child of her generation. About 10 years ago, she decided that this was silly and decided to rotate them in and out as her “every day” dishes, in addition to eating dinner every night in her formal dining room. When we go for lunch, it’s fancy china in the dining room. Eating a grilled cheese on a 100 year old plate is just delightful. And she gets SUCH a kick out of it every time. A good lesson. An unexpected side-effect of simplifying my clothes: The other day, I went to grab a top for slopping around the house in… Stared in confusion at my options for a little while, before I realised that now I only have my favourite tops left (ie ones I would be happy to go out and be seen in), I no longer have any ‘only for slopping about the house in’ clothes any more!